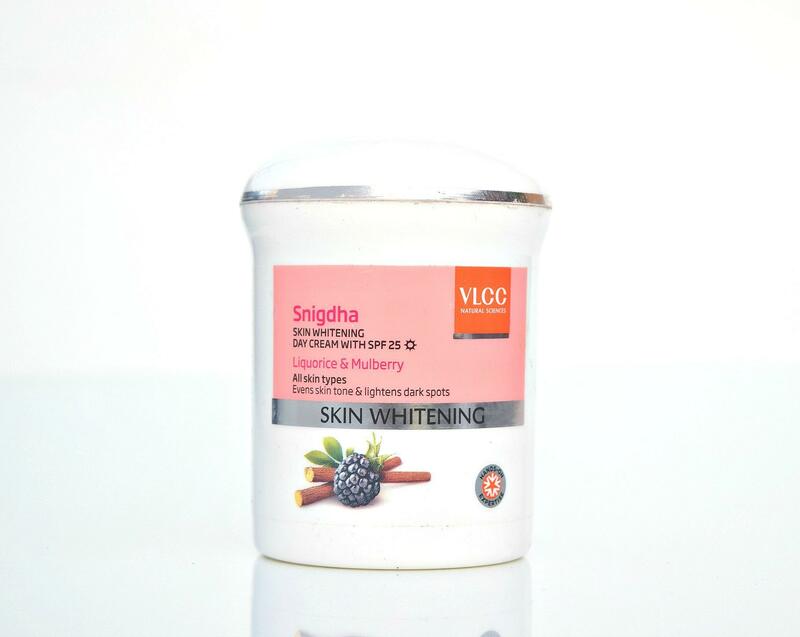 So this is why, I picked up the VLCC Snigdha day cream and was quite excited to try it since I could now skip the extra step in my skin care regime (the tacky, sweaty sunscreens :/, yes my current sunscreens makes me sweat like hell)! Now when a cream or any product says skin whitening, don’t go by the fact that it will make your skin whiter or lighter (nope it’s not gonna do that and nor any product on this planet) but it works in lightening the tan, dark spots and pigmentation you get due to harmful effects of UVA rays so if you are buying any lightening product, always buy it to target skin problems like tanning, dark spots, pigmentation, age spots, etc coz they basically work in lightening those skin problems while revealing your natural skin color and does not lighten your natural skin color. 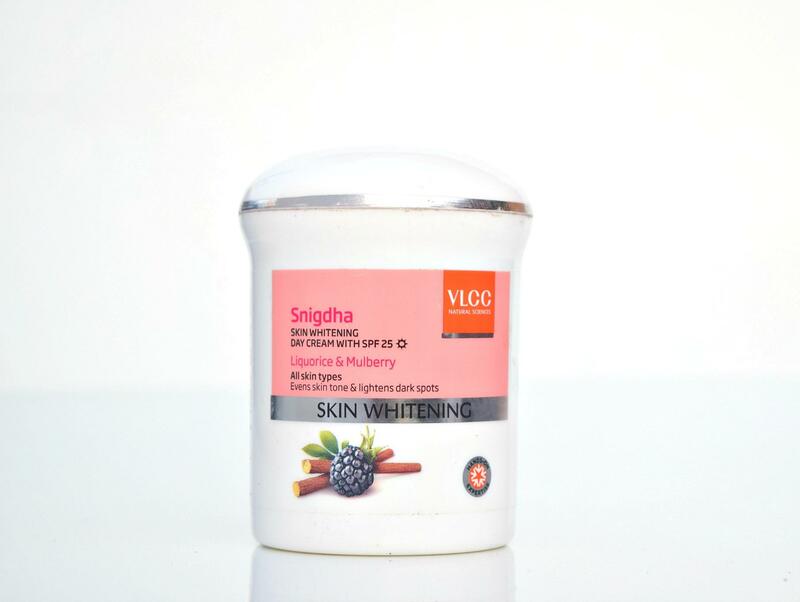 Coming back to the VLCC Snigdha day cream, the cream comes in an opaque jar (not the best packaging I would say but all day creams do come in a jar, don’t they? so I have no complain about the packaging except that I would love if VLCC makes it a pump dispenser packaging), the cream has a thick creamy texture which goes on smooth and spreads easily (takes a few seconds to completely absorb tho). It feels extremely light on my skin unlike most creams that feels heavy or tends to clog the pores, well, this does not do that! The cream has liquorice and mulberry extracts both of which are amazing lightening ingredients and works great in lightening the dark spots. I have been using this cream for last two weeks and I could tell that this cream works quite good for day to day basis where you don’t have to go the extra mile to use a sunscreen, a moisturizer, a treatment product and what not! I use just this cream in the morning when I’m at home and I’m good for the day, it moisturizes, protects my face with SPF 25 and also gives me a fresh bright look (what more could I ask for in a day cream?). I see absolutely no tanning but that’s also coz I use it when I’m at home and I follow a good anti-tanning routine even if I’m not tanned. I’ve felt a noticeable difference in my skin from the day I started using this cream and I’m really not sure if it’s this cream or the diet I’m following but my acne scars (I got from the horrible acne breakout I had a few weeks ago) have gone down a bit and my skin looks so much better now (perhaps the experiment I keep doing on my face have started giving me results). The only thing I don’t like about this cream is that it has parabens and it’s not the best option for someone with oily skin, it might make your skin a lil oily looking at how my t-zone turns oily after a few hours of using this cream. Amazing review as always… very helpful..thx for sharing dear! Previous Previous post: Top Winter Fashion Essentials For Women!